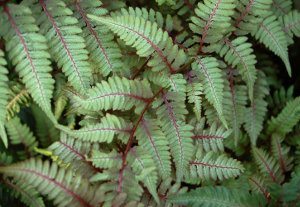 What makes this list more interesting than other low maintenance plant lists I’ve seen is that each plant is not only relatively easy to grow, but also highly beneficial to have in your garden. So here’s what I did. I worked with a former student of mine named Libby who’s also an organic gardener and more of a plant person than I am (I’m the soil guy), and we put together a list of our favorite low maintenance garden plants, most of which have a fairly broad range and so can be grown in a lot of places. And all but one of the plants are native to North America, which is pretty cool (if you live in North America, that is). Then I emailed some people I had come across online who are also plant people and I asked each of them for their favorite low maintenance yet highly beneficial plant, which I’ve included down below under the ‘Guest Contributions’ headings. Many of them had a hard time choosing one, and several wanted to know more about where in the world this plant would be growing because a plant that’s low maintenance in one place may be high maintenance or even non-growable in another place. She’s absolutely right. 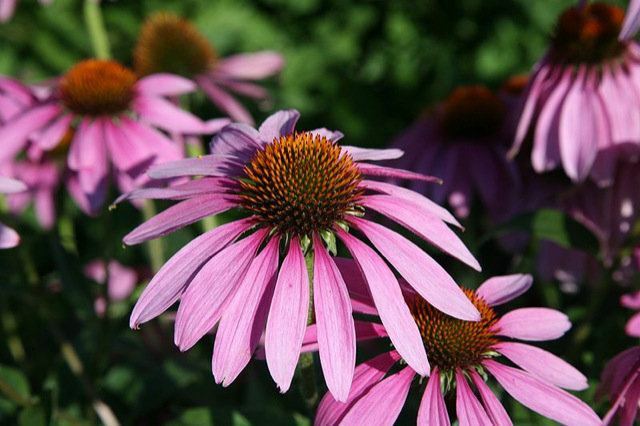 There’s really no such thing as a universally-applicable low maintenance plant list, so although many of the plants we chose are widely adaptable, be sure to make sure they’re right for your garden before you choose them. Before you start looking at which low maintenance garden plants would be right for you, it’s important to learn a little about your site. Observe the soil, light, moisture and wildlife in your area. And on top of that, I always encourage soil testing and subsequent organic fertilizing in order to make the soil as healthy as possible for your plants. Even if they’re natives, they still want appropriate soil. Starting off with the right plants in the right places means less time spent watering, weeding, pruning and fertilizing in the long run. And I encourage you to plant in guilds. If you haven’t heard of a plant guild before, it’s basically another way of saying a mini-community of plants. As you’ve seen in nature, plants tend to grow together with different plants at various levels from the upper tree canopy down to the low ground covers. Plants naturally form relationships and they can help or hinder each other. Some plants are great companions, while others may compete for nutrients or even release substances into the soil that are toxic to their neighbors. I’m focusing on species that are native to North America, and the better local nurseries will have the specific cultivars and varieties that are right for your area. Taking some time to find the right low maintenance plants for your site will pay off down the road. For example, if you only have a small garden bed to work with you’d be wise to choose a dwarf variety or naturally small tree to feature. Otherwise you’ll have many hours of pruning ahead of you to tame a tree too big for its bed. It takes some trial and error, but try to choose a combination of low maintenance landscaping plants that will complement each other and fill various roles, whether to provide food for you, attract pollinators, improve the soil quality, create bird habitat or provide beauty and colour. This list of trees with edible and/or medicinal fruit is a great place to start planning your high function, low maintenance garden. Trees are great for ecosystem health, in addition to the many functions I’ve listed below. Not only do they help to reduce the impacts of climate change by storing carbon, they also purify air and water, regulate moisture levels, prevent erosion and act as windbreaks. Depending on the size of the bed you’re planning, you may want to choose one feature tree and then a couple of shrubs from the list that comes after that. Origins: A number of plum species originated in North America, such as Black Plum, Chickasaw Plum and American Plum. There are also many popular cultivated varieties available with a wide range of fruit colors and flavors, and tree sizes and shapes. Functions: Tasty fruit eaten raw or cooked (or dried, which we call prunes) and make a good laxative, important food source for wildlife, provides shade, nesting cover for birds, habitat for native insect populations, beautiful flowers and foliage. Site Requirements: Full sun, well-drained soil, adequate space depending on the species and variety selected. Notes: May require other trees in the same genus nearby for pollination – ask at your nursery. Some nurseries may carry multi-graft trees with more than one variety on one tree. Fruit trees can be a lot of work if you choose, especially when you get into pruning, but my experience has been that plums, if left alone, don’t need pruning and don’t get nearly as much disease as other fruits. Origins: The Black Cherry (Prunus serotina) is native and common throughout most of the eastern half of North America. There are also many cultivated varieties of both sweet and sour cherries in a range of sizes from compact dwarf trees to those reaching over 100 feet in height. 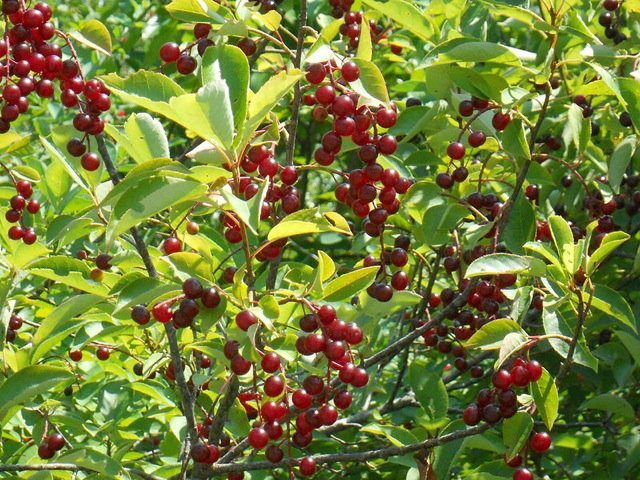 Functions: Food for humans, insects, birds and other wildlife, cherry can be a lovely flowering tree, shade, habitat, wide range of culinary uses in food and beverages, important Native American plant for food and medicine. Site Requirements: Specific requirements depend on variety but all require full sun and well-drained soil. I have one cherry in a bit of shade and wetter soil and it isn’t as happy as my other that’s in full sun. Notes: Sour cherries are self-fertile while sweet cherries require compatible varieties for pollination. If you don’t want the birds to get them all, you can buy bird nets. 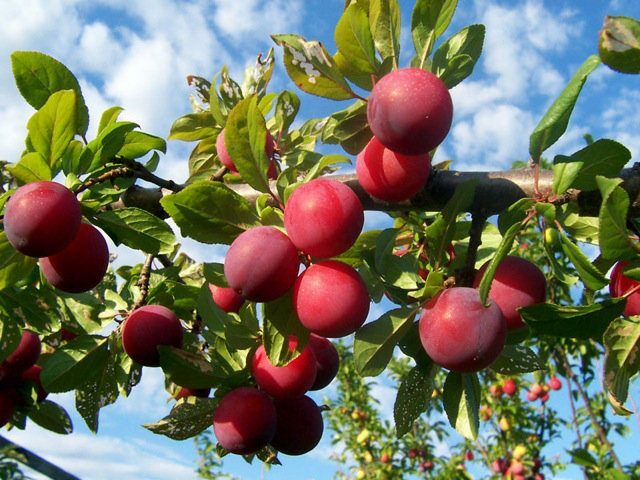 Like plums above, they’re quite hands off when compared to other common fruit trees. Origins: The many varieties of mulberries originate from around the globe as far as Asia, Africa and the Americas. 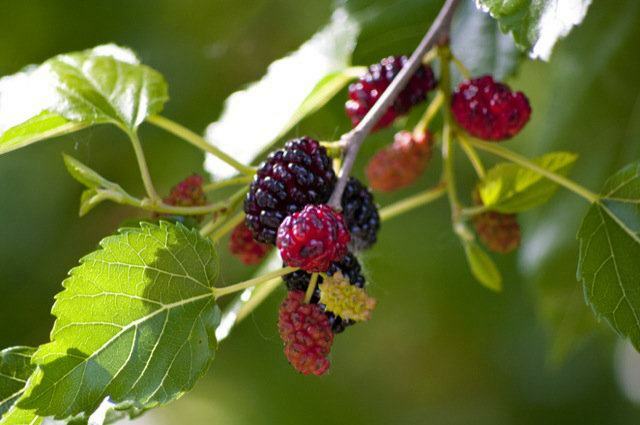 The Red Mulberry or Morus rubra is a species native to east and central North America. Functions: Great fresh and in jams, pies and preserves, food and habitat for native wildlife, shade, beauty. Site Requirements: Plant in full sun in a deep well-drained soil, away from sidewalks to avoid staining from fallen berries. Notes: Make your harvesting easier by laying a tarp and shaking the tree, as the fruit drops easily when it’s ripe. Mulberry trees are long lived, quick growing when young and often reach 30 to 50 feet in height. I encourage everyone to get one if they have the site for it. Origins: A number of varieties are native to North America. The Saskatoon Serviceberry is common in the northern states, Canada and Alaska. Some varieties are shrubby while others form larger trees. 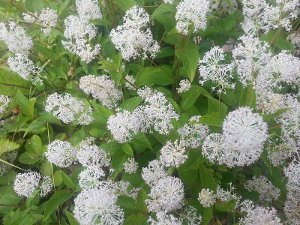 Functions: Ornamental value with lovely white blossoms in early spring and attractive orange to red foliage in fall, edible berries similar to blueberries, high in antioxidants, attracts pollinating insects, food and habitat for birds, mammals and insects, very low maintenance. Site Requirements: Prefers full sun but will tolerate some shade, some varieties will tolerate poor, dry soil. Notes: Strong wood withstands storms well. 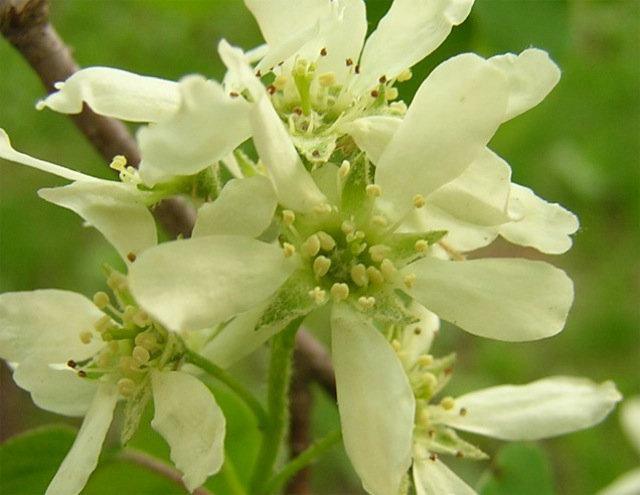 There are serviceberry trees and shrubs. My dad has hundreds of the shrubs growing in his nursery – a really beautiful plant when it’s flowering and you never have to touch it. Just give it enough space – I see a lot of serviceberry shrubs planted too close to the house. 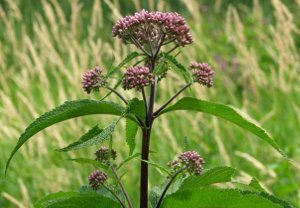 Origins: The North American native Sambucus canadensis or American Elderberry is a deciduous shrub with a loose habit reaching 5 to 12 feet in height. The European Black Elderberry is a close relative and will reach both a height and spread of about 20 feet. 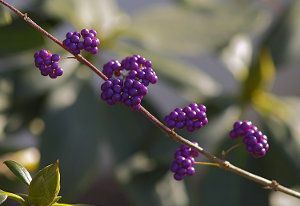 Functions: Many aesthetic, ecological, culinary and medicinal benefits, attracts butterflies and song birds, American Elderberry displays clusters of small white flowers in the summer, developing to dark purplish to black berries in the fall, the ripe berries are edible when cooked and are commonly used for cordials, jellies and wines. Site Requirements: Moist well-drained soil in full sun to partial shade. 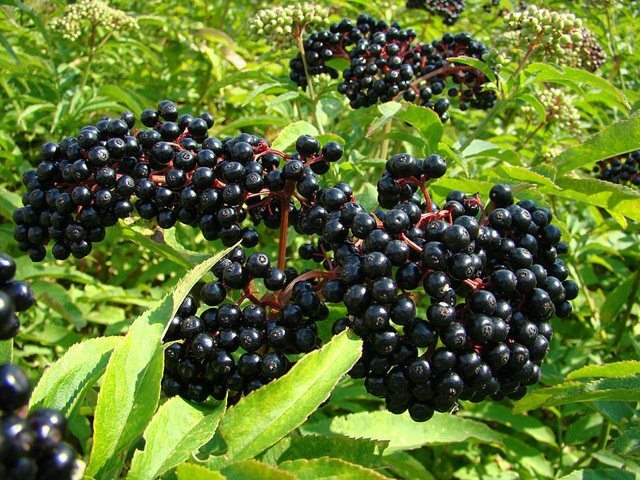 Notes: The leaves, roots and unripe berries of the elderberry plant contain toxic substances and should be avoided, ripe berries are high in antioxidants, vitamins C and A, iron and potassium. My elderberry is one of my favorite shrubs in my garden – it’s big and beautiful (currently taller than the fruit trees nearby) and the harvest is bountiful. Origins: Blueberries are native to North America and many species originate from various regions of the continent. 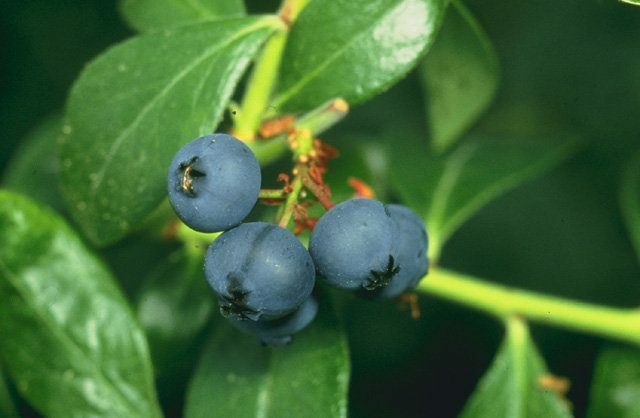 The Northern Highbush Blueberry is most commonly cultivated for commercial use and is native to the eastern and southern states and eastern Canada. 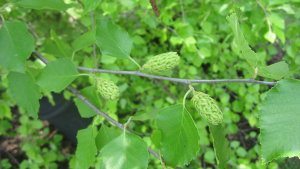 Functions: Highly nutritious, delicious and popular fruit, food source for wildlife, attractive shrub with white flowers in spring and brilliant leaf color in fall, medicinal uses. Site Requirements: It’s often suggested that blueberries prefer very acidic soil, but as I explain in my pH testing article, plants don’t really prefer any type of pH. What they usually love are certain nutrients (in the case of blueberries, that’s iron and sulfur) that they can more easily get in an acidic soil. The recommendation is often to use a lot of sulfur in order to increase soil acidity, whereas I recommend using a little sulfur only if a soil test says your soil needs it. On top of that, use lots and lots of compost because they want a highly organic soil. Many people use peat moss for this because it can also help increase acidity, but I prefer compost. People have grown incredible blueberries on high pH soils by using plenty of organic matter. Notes: Take care to select a variety that will do well in your climate. The nursery should have the right ones. Bunny rabbits like to eat mine down to the ground every spring, so some protection may be in order if you have them in your neighborhood. 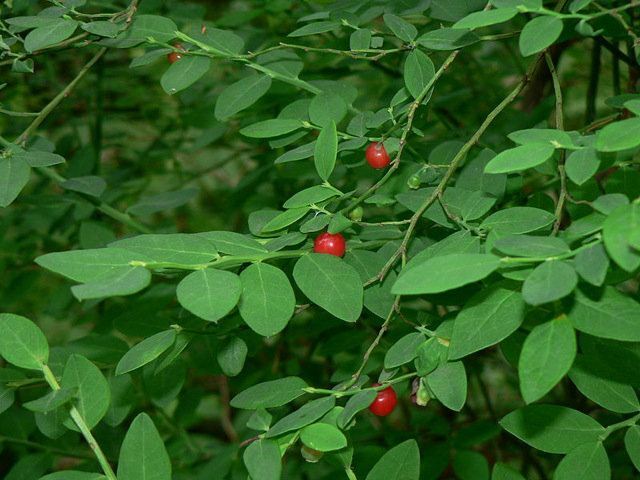 Origins: Both the Red Huckleberry (Vaccinium parvifolium) and Green Huckleberry (Vaccinium ovatum) are native to western North America, while the Black Huckleberry (Gaylussacia baccata) is native to a wide range of eastern North America. Functions: Tasty berries, an important plant in many Indigenous cultures in North America for food and medicine, some varieties are cultivated for ornamental use, food source for many wild creatures. Site Requirements: Most huckleberries like to grow near decaying wood and, like blueberries, often seem to due better in acidic soil because of the nutrient balance there (but they’ll also do fine in higher pH soil if they have lots of organic matter). Notes: Often used in habitat restoration projects and native plant gardens. They take a long time to reach maturity. Once you’ve picked some trees and shrubs to feature in your low maintenance garden design, it’s time to look at some suitable understory plants to fill in the gaps. Flowering plants provide colour and beauty while attracting pollinating insects. Nitrogen fixers will improve soil nutrients and make excellent “chop and drop” mulch plants. Origins: Rudbekia hirta is a native wildflower across eastern and central North America and naturalized through the rest of the continent. Functions: Popular ornamental with gorgeous bright blooms in late summer and early fall, attractive foliage, heat and drought tolerant, attracts butterflies, bees and other pollinating insects, makes lovely cut flowers, food and habitat for wildlife, used in traditional medicine of several Native American tribes. Site Requirements: Easy to start and maintain, prefers full sun to light shade and neutral pH soil, deadheading can encourage more blooms, can be self-seeding annual or short-lived perennial. Notes: The state flower of Maryland, often used in butterfly gardens. 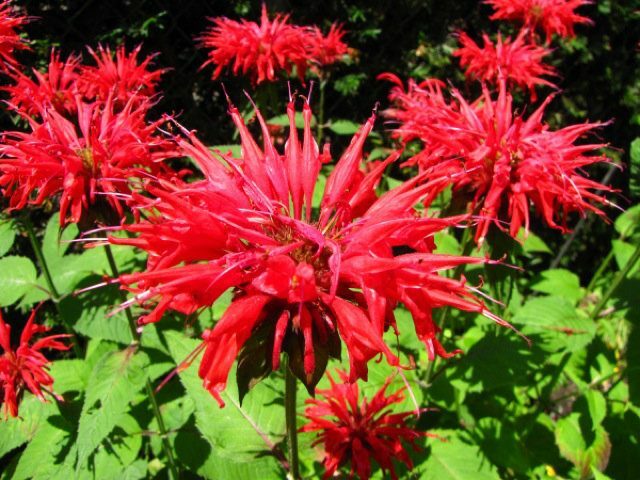 Origins: The Monarda genus is in the mint family and includes a number of wildflowers native to North America and varieties cultivated for ornamental use. Functions: Attracts hummingbirds, butterflies, bees and other insects, long history of medicinal use, aromatic leaves can be used in herbal teas and as culinary seasoning, edible flowers – use petals to garnish salads, use for fresh cut or dried flowers. Site Requirements: Full sun, prefers moist well-drained soil, some varieties will tolerate wet boggy soil. 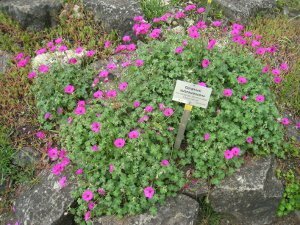 Notes: Over fifty commercial cultivars are available in a range of colors, however native varieties may produce hardier, more low maintenance plants. 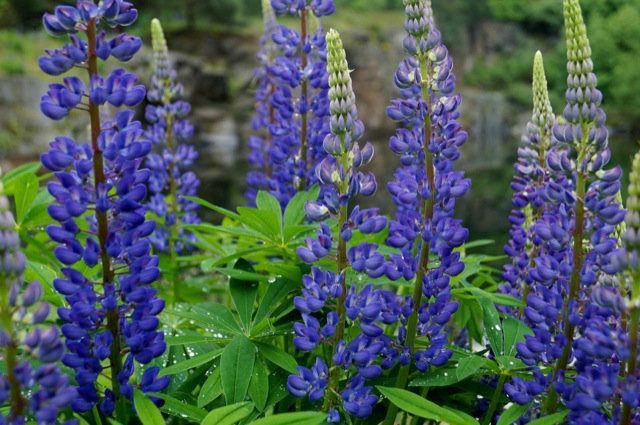 Origins: Although most lupines originated from the Mediterranean, a few species are native to North America such as the Nootka Lupine, Texas Bluebonnet and Yellow Bush Lupine. Functions: Accumulates nitrogen and phosphorus in the soil, host for native insects, ornamental varieties are cultivated for attractive blooms and foliage, some varieties have edible and nutritious seeds similar to soy beans, long history of agricultural use to improve soil and feed livestock. Site Requirements: Varies depending on the species however lupines in general are tolerant of poor soil, most prefer full sun and well-drained soil, some will tolerate shade. Notes: The genus Lupinus includes many species with a diverse range of properties and functions, so do some research to find the right variety to suit your needs. Some varieties have been considered invasive in certain conditions. Most are low maintenance perennials, but some are annuals and some are edible while others are toxic. Origins: All species are native to eastern and central North America. 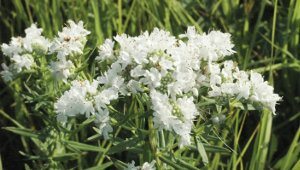 Functions: Widely used medicinally, attractive ornamental with showy flowers in the summer and attractive year-round foliage, attracts pollinators, butterflies and other insects. Site Requirements: A prairie wildflower that is highly drought and heat tolerant with a deep taproot, prefers sun or light shade, may not survive a damp winter. Notes: Although perennial, they are short-lived and may require replanting from time to time depending on conditions. Origins: Native to North America and temperate regions of Europe and Asia. 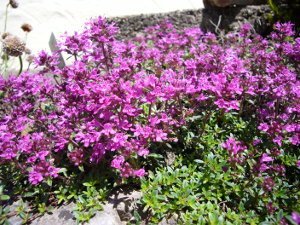 Functions: Good ground cover, accumulates nutrients in the soil, traditional medicinal uses, attracts bees and butterflies, some ornamental varieties have colored blooms, unique fern-like foliage, prevents soil erosion, used in herbal teas. Site Requirements: Prefers full sun and well-drained soil but will grow in conditions that are not ideal. “Yarrow (Achillea millefolium) is a pervasive plant throughout the Northern Hemisphere. Historically, nearly everywhere yarrow grows, it has been used as a hemostatic herb: to stop bleeding, especially bleeding caused by wounds. A great many of its traditional names indicate this property: The ancient Roman name herba militaris (soldier’s grass) and the North American Teton Dakota tribal designation tao-pi pezu’ta (medicine for the wounded) being two. 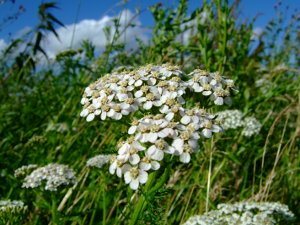 The Latin name itself, Achillea millefolium, means “the thousand-leaved plant of Achilles” – who used it to heal men hurt in battle. 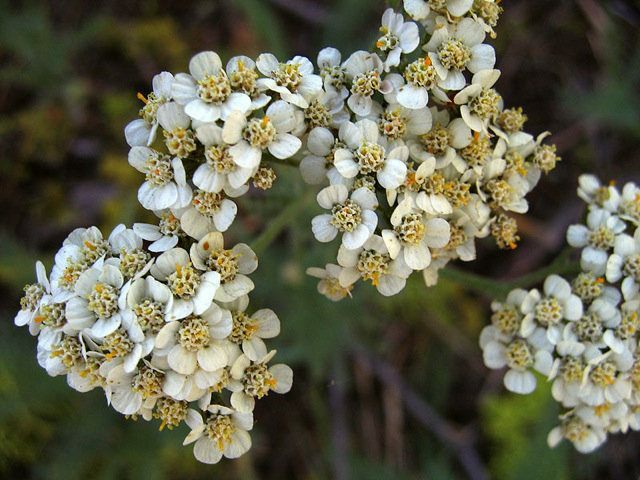 Even its common name, yarrow, is old English for “spear well” – to make well from spears. Origins: Fragaria virginiana is a small wild strawberry that’s native to North America, but modern cultivated strawberries are actually hybrids of the North American native that were crossed with a larger Chilean variety in Europe in the 1700s. Functions: Very popular fruit worldwide, delicious red berries for human and animal consumption, excellent ground cover, attracts pollinating insects, leaves can be used for tea, some traditional medicinal uses. 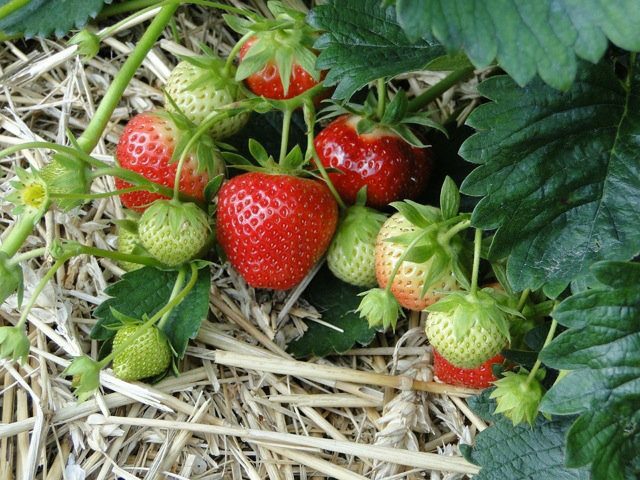 Site Requirements: Need full sun for fruit to ripen, well-drained soil, start from plants, Junebearers will take a year to get established and produce one large crop each spring, Dayneutrals will fruit all season and tend to produce fewer runners. Notes: Spreads by runners and can get overcrowded, but you can pot up your extra seedlings to sell or give away to friends. 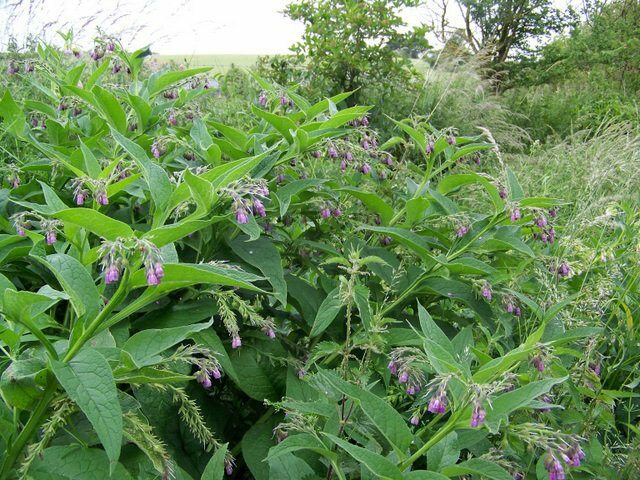 Origins: The only plant on this list that does not have a North American native variety, comfrey originated in Europe and is common in England and Ireland. Functions: Accumulates nutrients in the soil, excellent mulch plant, fast growing, chop and drop or add to compost, grown for 2000+ years for medicine, attracts pollinators, beautiful flowers and foliage. Site Requirements: Tolerates a wide range of conditions but prefers sun to partial shade and moist clay soil. Once established it is very difficult to remove, so take care in choosing an appropriate site. Notes: A highly multifunctional garden plant and excellent addition to a fruit tree guild to improve nutrient quality of the soil and suppress weed growth. Its long taproot mines nutrients from deep in the soil. Mine tries to spread throughout my garden, but I chop it back every month to use as an exceptionally nutritious mulch, and I use it when I’m making herbal teas as well (after the urine section). Daikon Radish (Raphanus sativus)Christy Wilhelmi, Garden Nerd: If you’re looking for a vegetable crop that’s easy, I tell everyone to grow radishes because they are “short-attention-span” vegetables. 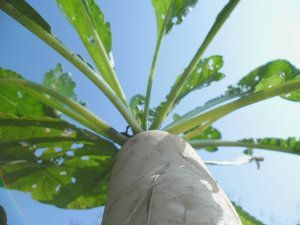 Done in 30 days, great for children’s gardens, and you can plant daikon radishes to break up clay soils over winter. Pull the veggies, throw compost in the holes they leave behind. Plant your next crop! Sulphur buckwheat (Eriogonum umbellatum)Kathy Settevendemie, Blackfoot Native Plants: Sulphur buckwheat (Eriogonum umbellatum) grows in lovely evergreen mats (several feet across) topped with creamy yellow flowers in an umbel that butterflies adore; it’s xeric, loves hot rocky soils, has lovely fall tinges of red (it’s attractive all year round) and is a hardy, zone 3 plant. 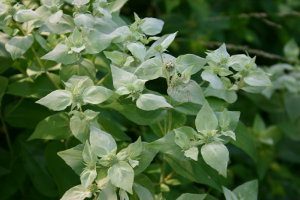 Virginia Mountain Mint (Pycnanthemum virginianum)Jennifer Baker, Sparrow Land Planning: My most favorite in the whole wide world plant (at least in my organic veg garden) is Virginia Mountain Mint, Pycnanthemum virginianum. I know some folks give mints a bad rap, but this hearty native is beautiful, blooms for three weeks or so and attracts more pollinators to the garden than I’ve ever seen. I’ve got video to prove it 🙂 I’ll just sit in the garden and watch it. That’s how much I love it. Seems the rest of the garden benefits from this minty shoulder-to-shoulder interaction. My potatoes only had a few potato bugs this year…so, I’m giving the mint credit. Catmint Walker’s Low (Nepeta x faassenii) (with California poppy in foreground)Susy Morris, Chiot’s Run: My favorite low maintenance plant is “Walker’s Low” Catmint, not only is it well behaved (i.e. no seeding down or spreading far and wide), it’s beautiful, smells great, and attracts loads of pollinators (you can also use it for a soothing tea). Hardy geraniumKathy Purdy, Cold Climate Gardening: Hardy geraniums are a favorite ground cover. 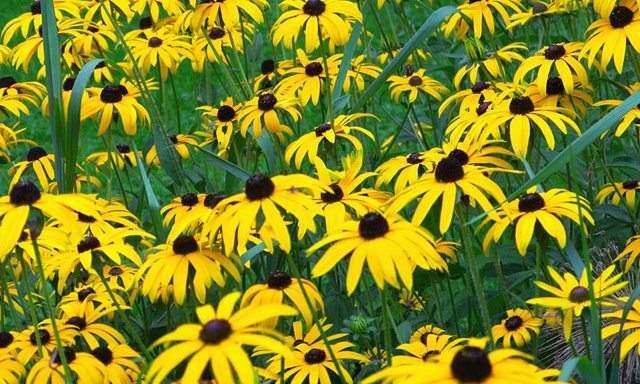 They have attractive fall foliage color, perky flowers in spring or summer (depending on the variety), not prone to diseases, and, while they will spread and cover ground, they are also easy to dig up where you don’t want them. I use them as a living mulch, suppressing weeds and looking attractive until I find decide I want to plant something else in that spot. A very useful plant, indeed. Creeping Thyme (Thymus serpyllum)Tova Roseman, Tova’s Garden: I’m thoroughly enjoying the many varieties of creeping thyme. 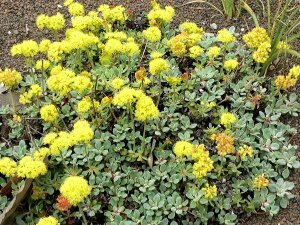 It is such a versatile groundcover plant for replacing a grass lawn or for creating a meandering path because it’s drought tolerant and evergreen. 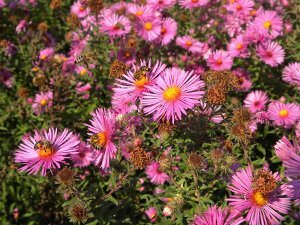 The blooming varieties attract bees and butterflies from late spring and into the fall. The more fragrant varieties such as lemon or lime thyme, produce a softly pungent citrus smell, when lightly crushed from being stepped on or brushed with your hand. Nova Anglia AsterTheresa Martz, Tending My Garden: I consider nova anglia aster, sedums, helianthus or heliopsis, boltonia, and autumn clematis an absolute must. Covered with bees and other beneficials along with the yellow garden spiders when they’re in bloom. And of course I have the regulars – yarrows, dill, parsley, oregano, thyme, borage and basil. The perennials with their living roots year round help keep the population of mycorrhiza strong and bring beneficials to the garden, and all of these plants serve to improve soil. When residue is cut back in the winter it all goes back to feed the soil and provide shelter for soil life and beneficials. Most of the roots I leave in the soil to decay in place so the soil life can remain active. Japanese Painted Fern (Athyrium niponicum ‘Pictum’)Ellen Novack, Gardening From A Hammock: Japanese Painted Fern (Athyrium niponicum ‘Pictum’) is a favourite low-maintenance plant. 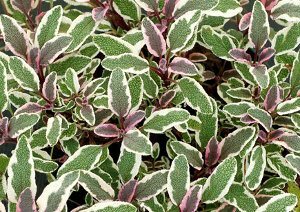 It’s non-invasive, slowly naturalizes, has intricate coloured and textured leaves, and lights up the shady garden. 12-24 in. (30-60 cm) Zone 4-9. Uses: accent, specimen, woodland. 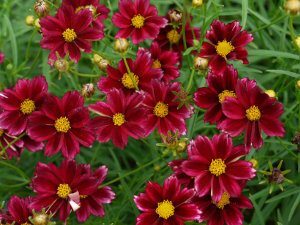 Coreopsis ‘Mercury Rising’Kerry Ann Mendez, Perennially Yours: One of my many favorites is Coreopsis ‘Mercury Rising’. The gem is part of the Big Bang series and it delivers dazzling red flowers with bright yellow centers month after month. With no deadheading! Add to this attribute the fact that it is drought tolerant, deer resistant and butterflies love it and we’re speaking garden nirvana. Just give it full sun and well-drained soil then step back and enjoy the show. Blue False Indigo (Baptisia australis) (Photo from Wildflower Farm) Miriam Goldberger, Wildflower Farm: My favorite low-maintenance plant is the wildflower called Blue False Indigo (Baptisia australis). 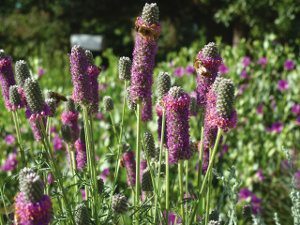 This all-round excellent plant blooms in early summer and provides pollen for the queen bumblebees and her workers at a time when nutrition sources are scarce in the garden! Plus, Blue False Indigo is in the legume family which means its deep roots return nitrogen to the soil. 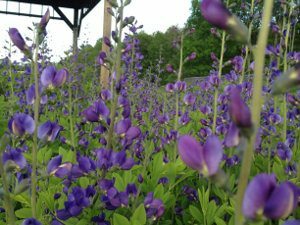 Blue False Indigo produces dramatic lupin-like flowers on long stems and is striking when used in floral arrangements. Swamp Milkweed (Asclepias incarnata)Janet Allen, Our Habitat Garden: I’m especially pleased to have in my yard is swamp milkweed (Asclepias incarnata). Milkweeds are essential food for monarch butterfly caterpillars so I love knowing I’m helping create more monarch butterflies. 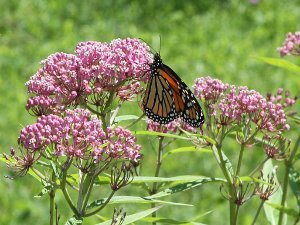 Swamp milkweed is especially easy to care for since it has clumping, not spreading, roots, and — despite its name — it grows in regular garden soil, not just in swamps. I love watching other butterflies and native bees enjoy its nectar, too. And in addition to all its eco-benefits, it has beautiful flowers! 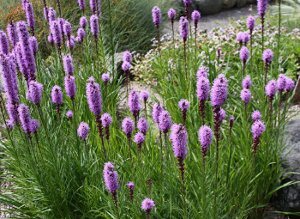 Blazing Star (Liatris spicata)Ellen Novack, Gardening From A Hammock: A low-maintenance, drought-tolerant plant is Blazing Star (Liatris spicata), a purple native spiky perennial with grassy leaves. Like a lot of native plants, it will take dry conditions in full sun. It grows about 18 inches high and is a favourite of bees and butterflies. 18-24 in. (45-60 cm) Zone 2-9. Uses: Accent, Butterflies and bees, Cut flower. Common Sunflower (Helianthus annuus)Susan J Tweit, Susan J Tweit: One of my favorite low-maintenance garden plants is the Common Sunflower. 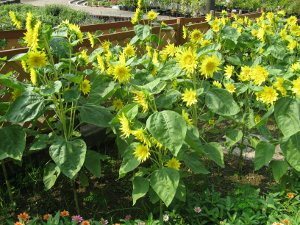 Helianthus annuus is native to North America, adaptable to a wide variety of soils and climate conditions, and easy to grow—it’s a great first garden plant for kids. Common Sunflowers also give a tremendous boost to edible and ornamental gardens by attracting native sunflower bees that also pollinate other plants. (And they’re easy-going and not likely to sting you, unlike honeybees.) There are dozens of varieties in a range of colors and sizes—the tall ones can be used as a hedge or windbreak—and they provide wonderful natural bird-feeders as well. Watching goldfinches clamber over sunflower heads like tiny parrots, sometimes hanging upside-down while extracting seeds with their sharp beaks is mesmerizing! Calamint (Calamintha nepeta ssp. 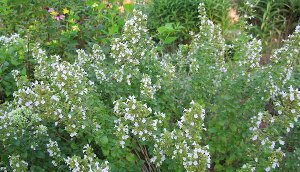 nepeta) (Photo by Carol Michel)Jo Ellen Meyers Sharp, Hoosier Gardener: This past summer, my favorite plant was calamint (Calamintha nepeta ssp. nepeta), a white-flowering perennial that had more bees and other pollinating insects than I could count. Calamint has a minty fragrance, not unlike a nepeta. It is not invasive or aggressive, and it bloomed all summer. Clustered mountain mint (Pycnanthemum muticum)Catherine Zimmerman, The Meadow Project: One of my favorite native perennials, Pycnanthemum muticum (Clustered mountain mint), is a pollinator magnet! It is one of the best sources of nectar for a wide variety of insects and is especially valuable to our native bees. 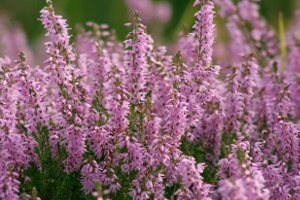 The foliage is fragrant when crushed and the silvery bracts and pinkish flowers make it an interesting and attractive plant for a meadow or perennial garden. As a member of the mint family, it naturally repels deer. I like to plant on the edges of a garden to confuse deer in an attempt to keep them away from the flowers they do love to munch! Mints can be aggressive, so plant with other aggressive species. The habit is compact and provides dense ground cover for wildlife and the underground rhizomes work as a soil stabilizer. And finally, it is easy to grow and maintain and you can use the leaves in tea. Absolutely, an all around great native plant! Be sure to check out the new documentary she’s working on about native plants, called Hometown Habitat. Joe Pye weed (Eupatorium maculatum)Heather Holm, Pollinators Of Native Plants: It’s hard to pick one plant but my vote would be for Joe Pye weed, Eupatorium maculatum. It’s long-lived, bold, and an important source of nectar for pollinators including bees and butterflies. ‘Silver Sabre’ Sage (Salvia officianalis)Genevieve Schmidt, North Coast Gardening: Currently, my favorite low maintenance useful plants in the garden are variegated and colorful culinary sage varieties. While the usual culinary sage, Salvia officianalis, has an attractive mounded habit and spires of lavender flowers which contrast nicely with its gray foliage, I’m an even bigger fan of the year-round interest of varieties such as ‘Icterina’, with its gold-splashed leaves, ‘Purpurea’ with its grey leaves and purple new growth, and ‘Silver Sabre’ which is similar to the older variety ‘Tricolor’, but has even wider cream-colored leaf margins and a vivid pink color to its new growth. When combined with variegated thyme, golden oregano, and other easy-care garden favorites like lavender, it makes for a cheerful and edible addition to the landscape. Best of all, these Mediterranean favorites need little supplemental water to perform well. Anise Hyssop (Agastache foeniculum)Kate Harries, Return Of The Native: I love Anise Hyssop (Agastache foeniculum) for its liquorice-scented leaves. It attracts butterflies and numerous other pollinators. Poor soil, drought, inattention – nothing bothers it. It looks great in a mass planting. It’s blue. Yarrow (Achillea millefolium)Angelo Eliades, Deep Green Permaculture: My favourite low maintenance companion plant that’s useful to have in the garden is Yarrow (Achillea millefolium). Yarrow: Attracts beneficial predator insects by into your garden to eat your garden pests (by providing the predators with a nectar source to keep them alive once they eat all the pests)… Stimulates the growth and vigour of nearby plants, and increases the aromatic oil content of culinary herbs and insect repellent plants… Works as a compost activator just like comfrey to speed up the decomposition process in your compost pile… Grows as a shallow rooted, dense groundcover on garden borders that creates a barrier to weeds, and being a wild plant, requires very little fertilizer or maintenance… Is a wonderful medicinal herb that has been used over centuries for wounds and a variety of other ailments! This was in my original list, but nice to have it as a duplicate because it’s definitely one of my favorites! 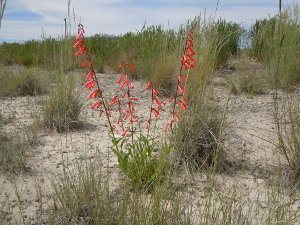 Penstemon eatoniiEvelyn Hadden, Less Lawn: I’ve recently moved to the high desert from the wetter tallgrass prairie. I’m enjoying the salvias and penstemons. Even garden sage (Salvia officinalis) [mentioned above by Genevieve Schmidt] makes a pretty awesome shrub in my Boise garden (3 feet tall and 5 feet wide! ), holding its gray-toned foliage year-round and attracting many pollinators with its summer flowers. Penstemon eatonii is my favorite new penstemon, because it keeps its glossy green foliage all winter and because the leaves are thick and low while the stems of bright red tubular flowers shoot well above them. Both these plants attract hummingbirds. Purple Prairie Clover (Dalea purpureum) (David’s Photo)David Salman, High Country Gardens: Dalea purpurea – It’s xeric. The flowers are very popular with native and honey bees and provide larval food for butterflies and moths. It’s a legume that adds nitrogen to the soil. If you’re like me, your garden is more than just a pretty place to pass by on your way out the door. It feeds you delicious fruits and vegetables, improves the soil and provides habitat for birds, bees and other critters in your neighbourhood. Our goal here is to find low maintenance plants that fill all of these needs without demanding a lot of time and energy. Locally-propagated native varieties will be adapted to your bioregion and appealing to native wildlife. If you have any comments or questions, feel free to share below. 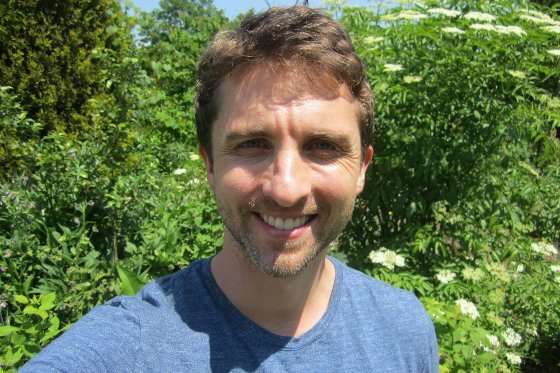 Previous: Music And Plants – How To Use Music To Boost Plant GrowthNext: Do Your Plants Know What You’re Thinking? Around where I live, plums and cherries are not so low maintenance around here. We have a serious problem with brown rot. The main solution offered is spraying, lots of it. I am surprised that apples and pears did not make your list as I find these fruits as far more useful than either plums or cherries. Yes, it absolutely depends on location. Overall, I consider plums and cherries to be lower maintenance, but not everywhere. Pears can be if they’re grafted well and cared for right. When we created this list, I was especially looking forward to hearing about other people’s experiences with fruit trees. Thanks for sharing. A few weeks ago I was talking about my experience using kelp when transplanting tomatoes and a friend suggested that kelp be applied to the ground around trees with this problem because the cause of brown rot is similar to the cause of blossom end rot in tomatoes. Thanks Louis, that’s a nice addition. I do this with kale too. Great list- some faithful standbys and new ones as well! Thank you! I’ll definitely be planting some of them this year. I was surprised to see strawberries as low maintenance. I always considered them very high maintenance to get decent berries and always replanting, digging, or moving countless runners on a continuous basis. Just my observation of course! Yes, if maximizing yield is a priority, strawberries do take some work. But you can also just let some wild strawberries travel slowly around the garden, and you’ll get some berries for very little effort. Have we said Foam flower (Tiarella cordifolia) yet? One of my faves! Amazing list Phil et al – you consistently share incredible content. Serviceberries spread by suckers fast, something to consider when planting. You need to cinsider Comfrey carefully where you plat it, the roots get 6 foot derp and hard to getvrid off, it also has long leaves, that can get floppy, bees especially bumblebees love it. 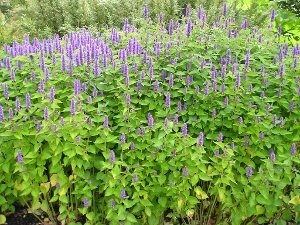 New jersey tea is a great plant for hummingbirds and bees. Buttefly bush Black King is loved by all. Plant crocus in the spring, daffodills, tulips.oriental lillies can be overplanted by catmint, etc for continuous netar. 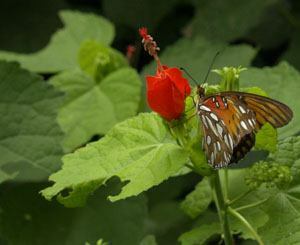 Monarchs love Titonia (mexican sunflower), the annuals cigar plant and salvia coccinea. My best pollinator plant, carefree perennial and spreading by seed ia Agastache foeniculum and hyssops. Borage is a great plant too, as well as stiff goldebrod. I like the new columnar apple trees for small yards. Great list – thanks for sharing. 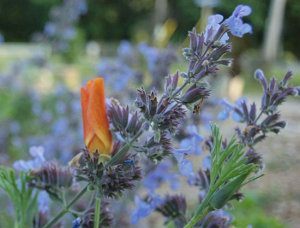 A note on borage – it’s not as opportunistic as comfrey, so definitely a good alternative. Great list..However, for this lazy person- nothing is “low” maintenance.